Rewards Canada: March 20 Update: Increased spend requirement for The Platinum Card from Amex, Alaska adds Condor as a partner & more! March 20 Update: Increased spend requirement for The Platinum Card from Amex, Alaska adds Condor as a partner & more! If you follow us on Facebook and/or Twitter you'll have seen our message alerting you to an upcoming change to The Platinum Card from American Express. Come this Thursday the card will require $3,000 in spending to receive the sign up bonus instead of the current $1,000. So if you have been considering the card we recommend applying for it by Wednesday so you only have to spend $1,000 over three months to get the sign up bonus. You can apply for the card here. Also another card we recommend getting now if you have been eyeing it is the American Express Simply Cash Preferred Credit Card. It has changes coming to it in April that are for the most part good but if you get it now part of the card that will change for the worse will be grandfathered at the current rate. Alaska Airlines announced a new frequent flyer partnership with Germany's Condor. Mileage Plan members will now be able to earn miles on Condor flights and soon enough will be able to redeem miles for their flights as well. This is really good news for Canadians as Condor has a decent presence here with seasonal flights out of Vancouver, Calgary, Whitehorse, Toronto and Halifax. You also continue to have the option to collect Miles & More miles with Condor but Mileage Plan definitely has a bigger presence here so if you are planning on flying this low cost German airline be sure to include your Mileage Plan number on the reservation. Of course we'll let you know once you'll be able to redeem miles for these flights as well. Find out more here. Good news for Air France KLM Flying Blue members who fly semi-frequently with the airline. 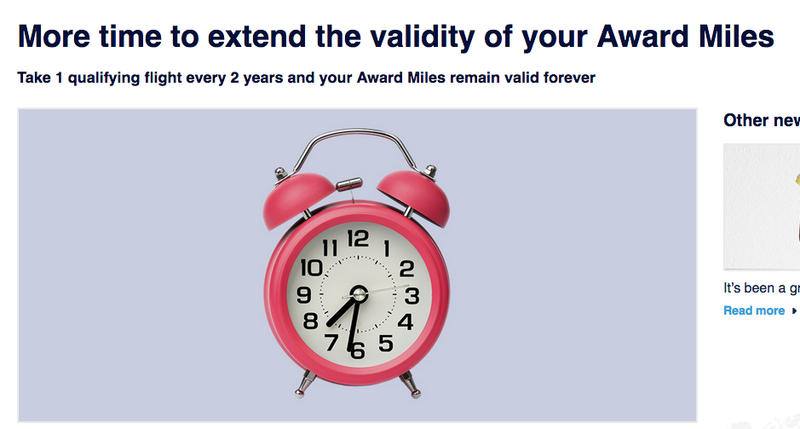 They have extended their expiry of their miles from 20 months to 24 months. Flying Blue is different than many of the other programs out there in that not all activity counts to keeping your account active. To keep the account active you have to have one qualifying flight on Air France, KLM and their airline affiliates or a SkyTeam airlines once in that 24 month period. This rule would not fall under the new Ontario legislation for expiring miles as it more so an inactivity rule than an expiry rule. Find out more here. What does this mean for NEXUS members? NEXUS kiosk display screens at all designated NEXUS airport locations in Canada are being updated to simplify the declaration process. Members will be prompted to respond to questions on the NEXUS kiosk screens that mirror the questions that were previously found on the paper CBSA Declaration Card. This change is being made to coincide with the upcoming launch of new Primary Inspection Kiosks that will expand self-service options to all international air travellers arriving in Canada. NEXUS members should continue to use their dedicated NEXUS kiosks, which are exclusively for their use and are designed to expedite their arrival to Canada. When and where will this change be made? Beginning late-March 2017, all travellers flying into the Ottawa Macdonald-Cartier International Airport will no longer be required to fill out a paper CBSA Declaration Card. The elimination of the paper CBSA Declaration Card will continue to be rolled out at other major Canadian airports across Canada, over the course of 2017-2018. Visit the CBSA NEXUS website for the most up-to-date information regarding where this automated service will be available for NEXUS members. Airline staff will distribute the paper CBSA Declaration Cards to travellers only if the airport is not equipped with the Primary Inspection Kiosks. If you are given a CBSA Declaration Card en route, please continue to fill it out. Ottawa gets it first and we wouldn't be surprised if that is quickly followed by Calgary (the new terminal has everything in place to do so) Vancouver and Toronto seeing that the last two see the most incoming passengers of any Canadian airports. TAP Portugal will be starting Toronto flights this June and have some decent fares for travel between Toronto and Lisbon. Fares start as low as $934 all in for Economy and under $3,000 for business class. Find out more here.